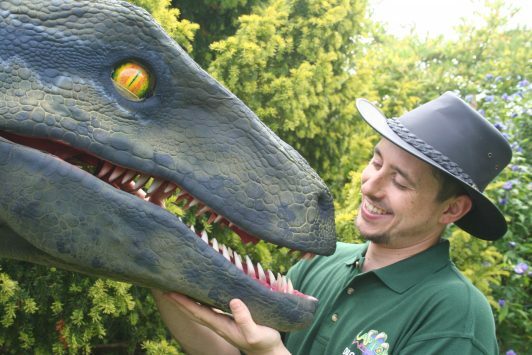 Here at Raptors World we have 4 dinosaurs that you can hire to attend your event. They come with a Ranger and make any event Roarsome!!! To find out more read their team profiles below. Hi, I’m Tom! I have always been a big reptile fan who has kept lots of different snakes over the years and have always loved dinosaurs. When I had the opportunity to keep a live Velociraptor, I couldn’t pass it up. The bond between us has grown so much so that she behaves most of the time for me and the other rangers. We go on many adventures together and are always looking for new people to meet! Raptor, the queen herself. 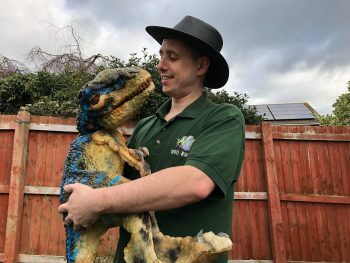 Raptor stands taller than her prehistoric family and doesn’t have as many feathers but we consider her to be the highest quality animatronic dinosaur in the UK. 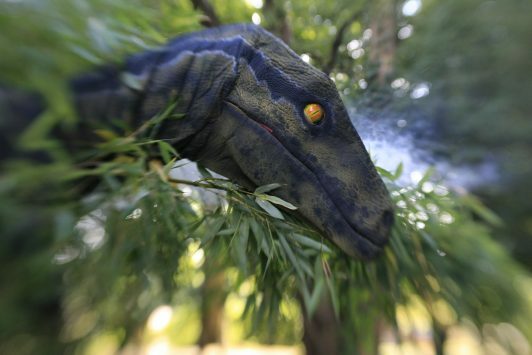 She is also the first animatronic Velociraptor in the UK! Raptor makes all the Raptor sounds, she measures in at just over 4M long, Normally well tempered but she does have a naughty side and she does enjoy the odd treat. Toppa was originally bought as a more natural treat for Raptor, however, he’s so sweet that we decided to keep him. 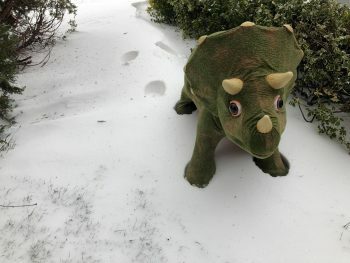 He’s very friendly and interactive, he loves to be fed his leaves and loves to have his chin rubbed and little ones can even sit on him. 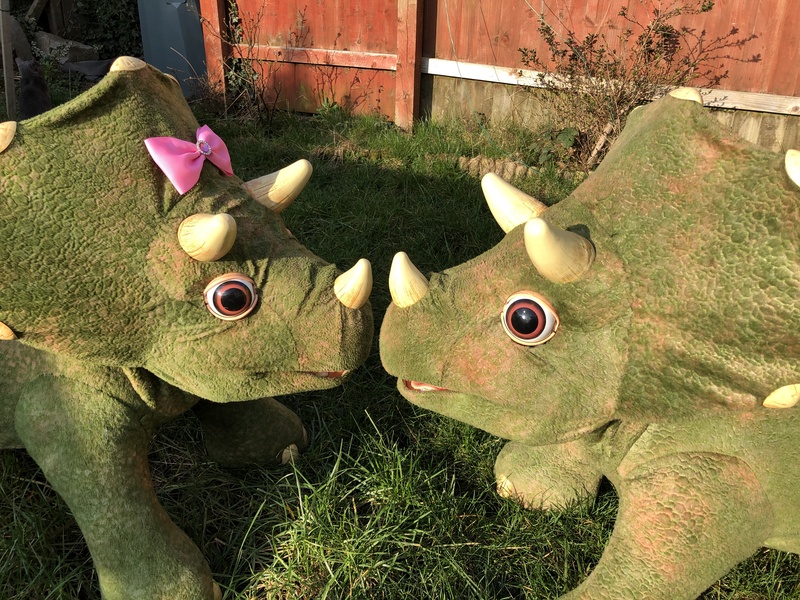 He quickly made great friends with Raptor too and will be attending any event/party that Raptor goes to as they are now inseparable! Cerra came to live with us a while after Toppa, we wanted him to have some company of his own kind. We saw how well Toppa got along with Raptor and hoped for the same with Cerra, we were not disappointed. Cerra is super friendly and loves kids, she's a fan of her food and will more than happily follow Toppa’s lead in letting the youngsters sit on her back. They are all so well bonded we dont part them and all three of them travel together wherever we go. Mischief is our most recent addition he was found deep in a jungle with no-one to care for him. He was brought to us as nobody knows Raptor's quite like we do. So far he's getting on with Raptor incredibly well and behaving. He's only young so prefers his rangers to hold him around people. He can be quite vocal and loves to let people know he’s there. He seems to love meeting new people. Don't miss out on your chance to book Raptor! Avoid delay, contact us today and make your event Roar-some!